Below is the Robert’s Snow illustrator-and-snowflake feature schedule for Wednesday, October 24 (scroll down after clicking “read the rest of this entry”). 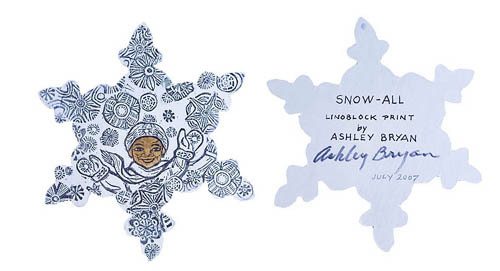 Featured here is Ashley Bryan’s snowflake for this year’s auction, entitled “Snow-All” (*). 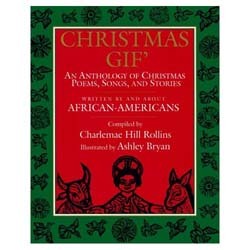 This snowflake, according to the auction site, was inspired by Bryan’s illustrations from Christmas Gif’: An Anthology of Christmas Poems, Songs, and Stories Written By and About African-Americans, compiled by Charlemae Hill Rollins and originally published in 1963 but re-released by HarperColllins in 1993 with Bryan’s illustrations and a new introduction by Augusta Baker. This snowflake is a “lino block” print (a method of placing permanent designs on surfaces by carving a pattern on a wood or linoleum block, inking it, and transferring it to the material being decorated). 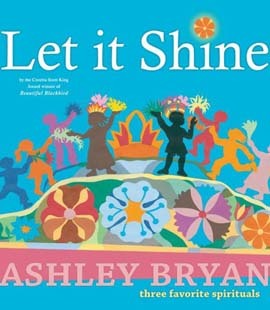 Bryan also released Let it Shine: Three Favorite Spirituals this year (January; Atheneum), which I reviewed here in August. This is one beautiful book, featuring Bryan’s immense talents with cut paper collage. If you haven’t seen it already, go treat yourself. Ashley’s snowflake will be auctioned off in Auction 3 from December 3 to 7. Also, please don’t miss this feature on “foxtacular elficide” and Sophie Blackall by Jennifer (a.k.a. literaticat) at not your mother’s bookclub. It’s from yesterday but was posted later in the day, so I’m pointing it out again so that you won’t miss that great snowflake. Really, that’s a top-fiver for me. I think my earliest memory is from preschool, making papier mache-covered balloon animals. I got in trouble because I was more interested in mooshing my hands around in the flour paste than actually finishing my project. Another time, in first grade, we did line drawings on burlap and then embroidered the lines with blunt needles. My drawing was of a lion and a tree and I was proud of it, until the art teacher picked out some of my stitching and “fixed” it. There was a rule against drawing “lollipop trees,” which was sad because that’s how little kids see a tree–a stick and a blob on top of it. She hung my lion in the hallway and told me how nice it was, but I couldn’t even look at it–it wasn’t mine any more. And you really want to meet Shanté, as featured by Susan at Chicken Spaghetti! It would be so totally cool to win the auction on this flake!